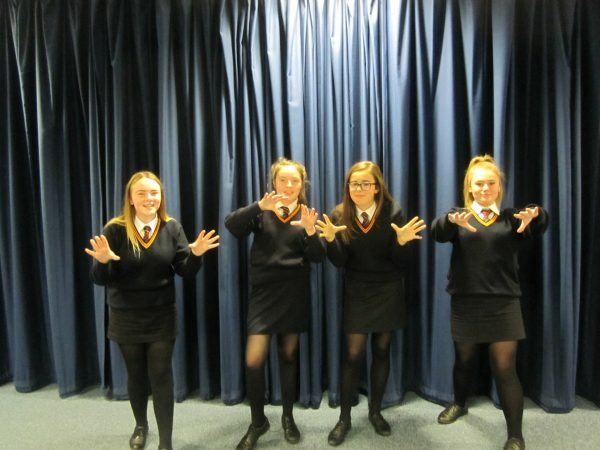 At the Belfast Model School for Girls Drama is seen as both an art form in its own right, and as a learning medium which has application across the whole curriculum. At Key Stage 3, The Drama Department aims to support the school’s vision that every student should strive to be the best they can be, by building up their self-confidence, self-esteem and ambition. It is our belief that it is an understanding of, and empathy for, other people’s feelings and situations that makes us form positive relationships and provide an understanding of the world in which we live. The Drama Department aims to provide all students with the emotional intelligence necessary to ensure they become positive contributors to our society. The Department’s diverse and engaging curriculum allows all students to build their confidence and knowledge as well as develop their speaking and listening skills, benefitting students in whatever choices they make. The Drama Department encourages students to explore and take risks as well as developing a sense of responsibility thereby becoming independent learners. We want our pupils to feel good about their successes, yet they should also know that it is perfectly reasonable not to be a success – yet. The key here is that we give our students the resilience to keep trying. It is our aim that pupils will leave our leave school with ambition, positive self-esteem and air of confidence that will equip them for the demands of the world of work. 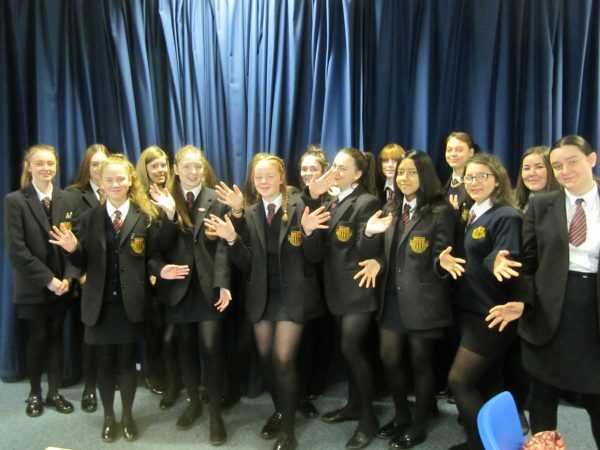 Drama is taught in Years 8, 9 and 10 for one hour and twenty minutes per week and students can also choose to study Drama as a GCSE and A-Level subject. After school Drama clubs are available to students of all ages to supplement curriculum time, build on skills or just to have fun! Drama at Key Stage 3 is all about putting yourself into other people’s shoes – by taking on roles and enacting situations the students can gain a unique understanding of a range of issues and situations from a personal point of view. Some of the topics covered are Friendship, Homelessness, Body Image and Peer Pressure. During Key Stage 3 the emphasis is on content, although students will also be learning Drama Skills such as Use of Voice, Posture, Gesture, Body Language and Movement. Empathy, confidence, and good communication skills are promoted throughout the course. In addition in to the above, students in Year 10 will also be guided in the skills they need to develop should they choose to pursue Drama in Key Stage 4. The Junior Drama club is for all students in year 8, 9 and 10 who are interested in learning about and extending their drama skills. The club takes place on Wednesday after school in Drama room G1, from 3.05 – 4.05 and students can avail of the free bus service home. The club is a drop in so attendance every week is not compulsory. This allows students to attend one of the many other clubs that also run on a Wednesday as well as Junior Drama Club. Students create original work based on a range of topics and use techniques and genre to further their performances. This club offers students the opportunity to work and socialise with students from different classes and year groups. All students have fun in this friendly and energetic environment. At Key Stage 4 the emphasis shifts slightly and students are trained in the art of performance. 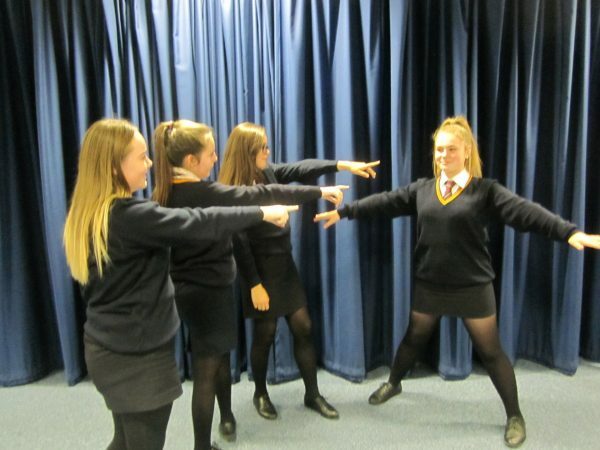 Choosing Drama as a GCSE option is not just for students who wish to pursue a career in the performing arts – this course is an excellent basis for any career that demands team work, communication skills, empathy and confidence. Why DRAMA ? Students choose either a performance or design pathway. In response to pre-release stimulus material, they either devise and present a group performance or devise and give a design presentation. Design students must choose one of the following disciplines: costume, lighting, multimedia, set or sound. Students also complete a student log. Students choose either a performance or a design pathway. Students choose one set text from the list below. They develop understanding of the text and elements such as the playwright’s use of language, style and genre. They also consider contexts and aspects of performance, production and design. • Philadelphia, Here I Come! Students studying GCSE and A-Level Drama will also have the opportunity to visit theatres in Belfast to see performances, and theatre companies and performers will come into school, making use of our state of the art Performing Arts Theatre. Click on link below for an overview of the GCSE Drama Course. The Drama Studio is equipped with lighting rig, sound facilities and 360 degree cyclorama.